MooreReppion.com Blog: Blog Buddies 4. I'm not going to patronise you, you know who Ben Templesmith is already. Oh alright then I'll patronise you. 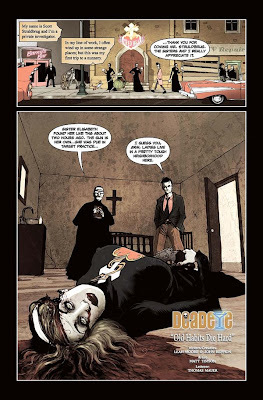 Mr. Templesmith is the Eisner award winning artist and co-creator (with Steve Niles) of 30 days of Night. He's also worked on loads and loads of stuff from Buffy the Vampire Slayer to his self penned books Wormwood Gentlman Corpse and Welcome to Hoxford. Oh and he's brilliant. I mean stupidly talented. The sort of artist we could only dream of working with... but we are! Those of you wishing to keep track of what Mr. Templesmith is currently working on (usually a lot of stuff) should add http://bentemplesmith.blogspot.com to their bookmarks. 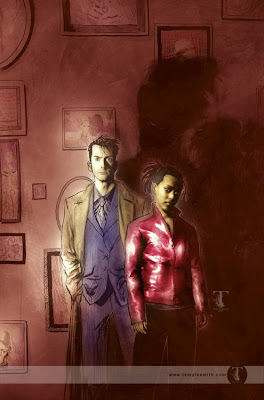 Doctor Who - The Whispering Gallery is due out late February 2009 and the Previews catalog order number is: DEC084084. You can read an interview with Leah and myself about the one-shot over on CBR. Matt Timson is an incredibly talented chap who has been working as a professional illustrator for a good few years now. The thing is, like a lot of pro illustrators making decent money, Matt foolishly always wanted to be a comic artist. I know, beggars belief doesn't it? Well now he is one and a bloody good one at that! We first became aware of Mr. Timson via his work in The End Is Nigh and his collaborations with the legendary Paul Scott in OmniVistaScope. Leah and I pestered him for a long, long time and eventually he agreed to help us develop our retro-futuristic horror detective concept Deadeye - stories from which have already appeared in Image Comics' Popgun Vol 1 & 2 with more to come in the future (watch this space!). 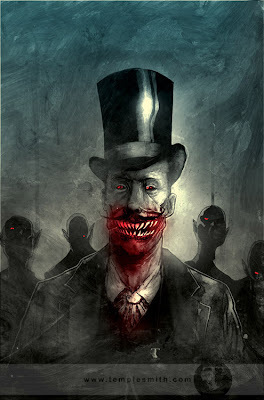 Millions of vampires have descended upon America. In a desperate bid to defeat them, the U.S. military nuked New York City but unfortunately, it was too little, too late. The vampire horde had already advanced westward, but how far? A team of soldiers sent to rescue a politician's plane that crash-landed in New Jersey find out the hard way. Humanity's only chance may rest in the hands of vampire hunter Vlad the Impaler and his new companion, a depressed New York City detective who wishes he was dead. The series is already getting rave reviews and Matt's artwork is quite rightly being praised as some of the nicest looking stuff around. Do yourself a favour and pick up a copy at your earliest convenience (I'm getting mine on Saturday). For those of you curious about the master's process there's a very insightful step by step for Matt's cover to Impaler #1 here on ComicMonsters.com.